Aqua Blue Designs Inc. is proud to offer a great product. With that we want our owners to have the information necessary to enjoy their pool for many years to come. You will find a few items below that are important to us and our new pool owners. Water chemistry is a very important part of pool maintenance. It is fun and safe to swim in fresh clean water. The clarity of your water also affects the operation and longevity of your filtration and heating equipment. You should make it a high priority to keep your pool and spa water safe. At Aqua Blue Designs, we build in ways to make it as easy as possible to keep your water clean, clear and safe. Here is a brief explanation of what we do to accomplish this. Please follow the links provided to get more detailed information from our suppliers. Pool water chemistry should be tested and adjusted on a regular basis, at least once per week, and more often if there has been rain or heavy pool usage. Testing should include sanitizer levels, pH levels and alkalinity levels. With fiberglass pools, these three items are the most important. If you have a concrete pool, you should also test for calcium hardness. Testing can be done with a test kit or test strips. Most test strips are accurate enough for pool water testing and are much easier to use than a test kit. Since they take only a few second to use, you are more likely to test your water on a regular basis. Until recently, only commercial pools have used automated water testing do to the great expense. Goldline Controls has now introduced a new affordable system that automates testing of water. Most of our pools use salt water chlorination to eliminate buying, handling and storing chlorine. Fiberglass pools are made from very stable materials that do not affect water chemicals. This means that pH and alkalinity levels are more stable than in other types of pools. Salt water chlorinators use salt to generate chlorine. Pure sodium chloride is added to the pool water. As the water is recirculated through the pump and filter, it also passes through an electronic device that turns part of the salt into chlorine. This chlorine is then pumped back into the pool where is acts as a sanitizer. A healthy amount of chlorine for a pool is about 3 parts per million or ppm. The amount of chlorine required to maintain a certain ppm varies with pool usage, sunshine, dirt, rain and other contaminates that may enter the pool. 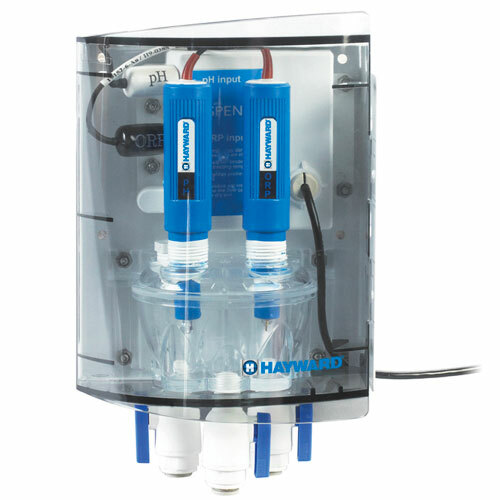 The chlorine generator can be controlled in one of three ways: adjusting the percentage of output, varying the time the pump is running, or by utilizing an automated testing system (follow the Hayward link below for more details). We were among the first in our area to promote energy efficient heat pump pool heaters, filtration pumps, control systems and non-porous fiberglass construction materials. Together, these features will save you over half on operating costs. If you add an automatic pool cover, even more energy savings can be achieved. The average backyard swimming pool requires a one horsepower pump to adequately recirculate water. Many manufacturers of pumps are using high efficiency motors that save a large percentage of the power over older models. Electronic timers allow you to run your pump at one or more cycles during the day. Our filtration systems can run 8 to 12 hours per day and keep the water safe and beautiful. Heat pumps extract heat from the surrounding air and transfer it to the pool water using electricity. Two drawbacks of heat pumps are slower heating and a higher required ambient operating temperature. Most heat pumps cannot heat water when the outside temperature is below 45°F. When temperatures are above 45°F, heat pumps do very well at maintaining pool water temperature. However, most people do not want to swim when the air temperature is below 45°F. So, heatpumps in the Midwestern US make a lot of sense. They are the best way to efficiently add heat to a swimming pool, saving as much as 70% of the cost of using a gas heater. Gas fired heaters use either propane or natural gas to heat water. The main advantage is fast heating which makes sense for only heating the pool during certain periods such as weekends. The cost of running gas heaters is two to three times the cost of a heat pump. Solar Covers, Winter Covers, Automatic Covers... which is best? Solar covers are inexpensive but will save a large portion of your heating bill when properly used. They keep evaporation down and at the same time allow solar gain and insulation during nighttime hours. The problem is that they are difficult to place on the pool and are hard to handle and store. Winter covers are great at keeping the pool clean and safe during extended time of non use of your pool. However, they require an hour or so to put on, and another equal amount of time to take off. We recommend winter covers for those who operate their pools when average daytime temperatures reach about 60° F.
Automatic covers are great for people who want to save the most energy and keep their pool operating at the lowest average outdoor temperatures. When closed, automatic covers keep debris and uninvited guests out and when open, allow full use of the pool. You can keep the pool closed except when in use, saving energy, chemicals and water. We recycle all of the cardboard, paper, metals and other left over products from our operations. We install fiberglass pools that require half of the pump run time of liner and gunite pools. This translates to half of the energy cost of other types of pools. Fiberglass just makes a better water container with the non-pourous surfaces that stay clean with little effort. Fiberglass pool shells never need to be resurfaced or have their liners changed (because there is no liner!). This saves land fill materials from being generated, sand blasting dust from being generated, and conserves your hard-earned money as well. We use cartridge filters which conserve water by never requiring backwashing. These filters also conserve chemicals and prevent pool water from contaminating our streams.